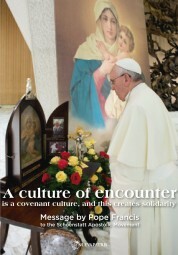 Produktinformationen "A culture of encounter is a covenant culture, and this creates solidarity"
"The Holy Father uses the format of an honest and direct dialogue to give us his vision and expectations of the topics which formed the focus of the experiences and pastoral projects of the jubilee celebrations in Schoenstatt: family life, education, youth evangelization, the church, and a new social order. It is the Holy Father’s message to an ecclesial movement of renewal during a moment of grace, both in the jubilee celebration of our founding and this moment in the life of the Church. One can understand the deeper meaning and value of this audience when seen from the real life that preceded it and reflects an experience of the church that our founder, Fr. Joseph Kentenich, desired through his work and selflessness -- a Church that is truly family, not only in spirit but also in its forms and attitudes." Weiterführende Links zu "A culture of encounter is a covenant culture, and this creates solidarity"
Kundenbewertungen für "A culture of encounter is a covenant culture, and this creates solidarity"